We have Private Off Road Parking for ALL our guests cars and free WiFi throughout the house. We are situated in a quiet location, yet only a 5 minute level stroll to Keswick town centre, Derwentwater and Theatre By The Lake. Discount Vouchers available for our guests with £3.00 off per ticket for Theatre By The Lake. You are always guaranteed the best possible price booking direct with us. Please phone 017687 73891 or e mail reception@allerdale-house.co.uk or visit our website www.allerdale-house.co.uk and book on line. We look forward to welcoming you to Allerdale House. The following April dates are available: Mon 22 - Sat 27 April. Any 2-3 nights @ £205, 4 nights @ £255, 5 nights @ £305, all fully inclusive. Morven Cottage sleeps 4 guests (plus a cot) in very comfortable and warm accommodation. The cottage is Visit England rated as 4* and is decorated, furnished and equipped to a very high standard. The cottage is in Ambleside Road, a quiet residential area on the edge of the centre of Keswick and adjacent to St. John's Church, has its own gated drive, two private off-road parking spaces adjacent to the cottage and a private and enclosed patio/garden area with Lakeland slate benches. Free wireless internet access is available. See the website for full details and many images. Stylish, second floor two bed apartment, close to town, parking. With walks straight from the door. All of our 4 star houses and apartments are within walking distance of town and have dedicated parking - great locations to walk from your door. Our newest property, 9 Greta Grove House is a very spacious second floor apartment with great views. Sleeping 4 in a large king size double ensuite room and a twin room. The spacious lounge/diner is bright and airy with high quality furniture and fittings and large library of guidebooks and maps for cozy evenings in. All of our remaining properties are very very well equipped with quality furniture, fittings and bedding. We offer dog friendly accommodation at 3 Grizedale Close, Derwent Cottage and Riverside View. Lilac Cottage , 5 Howrahs Court, Latrigg View, 13 Greta Grove House and Felltops all offer you great value homes from home. See our website for more details and for availability for 2019. Lovely 4* Gold Award accommodation, with parking, in the heart of Keswick, 2 bedrooms, sleeps 4. Wonderful accommodation with high quality furniture, fittings and bedlinen, new kitchen and bathroom. Quiet residential area within easy walking distance of town and Derwentwater. Wonderful two bedroom ground floor apartment with fantastic views, very close to town, with parking. 5 Howrahs Court is a modern two bedroom, two bathroom apartment overlooking the rugby field with fantastic views west towards Catbells and the Newlands Valley. It has a large lounge/ diner, double ensuite bedroom and twin with family bathroom - ideal for families or friends sharing. It is a two minute walk to Booths supermarket and central town and a five minute stroll to Crow Park and Derwentwater. Great base to explore the fells on foot, straight from the door. Perfect location, any time of the year. Bedrooms consist of a large double room with king size bed, TV and oak wardrobe and drawers. The second bedroom is a single with plenty of space. The fully tiled bathroom has a bath with electric shower over, toilet, wash hand basin and shaver point. You can walk from the door, it is a five minute stroll to Derwentwater and Theatre by the Lake. Enjoy the wonderful views from this popular dog friendly bungalow, within walking distance of town. Four star accommodation, a short walk from town and Derwentwater and parking for 2 cars. Immaculately clean, sleeping four in one double and one twin room, lovely lounge with great views and well equipped kitchen and brand new bathroom. Garage for cycle storage and enclosed rear garden. All our rooms have flat screen TVs , coffee & tea making facilities, en- suite with local toiletries, fluffy white towels . 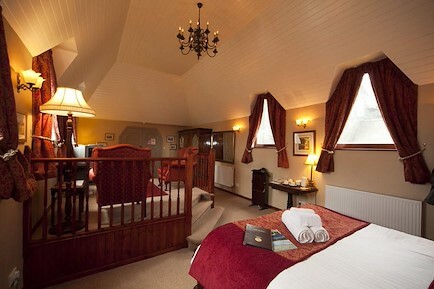 Latrigg & Siddaw rooms are large rooms with king size beds and sofas both with Lakeland fell views. Catbells and Walla Cragg are cosy rooms with double beds . A warm Keswick welcome and scrummy breakfast using local ingredients awaits you. Croft House Cottages Easter availability with spectacular views at Croft Corner - just for 2 people. Week of April 20th now £460. Short breaks:3 nights £260, 4 nights £340. Croft Corner accommodates just 2 people. There are spectacular views to Skiddaw and to Latrigg. Fell walks from the door and three restaurants and health spa facilities within walking distance. See www.crofthousecottages.co.uk for full details of the location and the property or phone 017687 73693. Our rates include all fuel, wifi, towels, and bed linen - there is no booking fee. Croft Corner is managed and maintained by local owners who will deal with your booking personally. Croft House Cottages Easter weekend availability and panoramic views for 4 people at Croftside - between 18th and 27th April: Any 7 nights £620, 5 nights £560, 4 nights £520. 3 nights £480. Between 18th and 27th April: 4 nights £520, 5 nights £5608. 7 nights £620. Also available for the week of April 27th at £603. See www.crofthousecottages.co.uk for full details of the location and the property. Our rates include all fuel, wifi, towels and bed linen. There is no booking fee. Croftside is managed and maintained by local owners who will deal with your booking personally. Spacious well-equipped accommodation in a quiet location close to town centre. 3 bedrooms / 2 bathrooms / garden / parking. Also, see our Tripadvisor reviews at 'Gable Cottage Keswick'. Saturday 11th May - 7 nights £525. Sleeps 5. Walks from the door and fabulous views from the cottage. Please note: We have three cottages in Thornthwaite. The pictures here are of Jasmine cottage (also sleeps 4). The late availability advertised is for Fox Howe cottage which is just as lovely. Please see our website (link above) for more details and pictures of this cottage. Cragside Guest House Until 2nd November 2019. Double en-suite, or 'Flexible' (Kingsize double, or twin) en-suite rooms available. From £78 to £85 per room per night B&B. 'Read More'. en-suite rooms. Unrestricted free parking. Free WiFi. scenic views. 5 minute walk to Keswick Market square. £60 to £80 per night for single occupancy of a double room. For extra information or to book a room, please email, phone 017687 73344, or Mobile 07444437226, or book online. offering generous sized rooms, Cozy and Very Comfy. Central Heated. Double Bedroom with Views and Very Comfy 5FT Bed! Located in Keswick - Stunning Views & Most Spacious Self Cater Cottage in Keswick! Double ensuite room available for 9th and 10th May. we still have limited availability for April in our Skiddaw & Catbells rooms call 01768773792. All our rooms are en suite with TV/DVD players, tea & coffee making facilities,toiletries & fluffy white towels. 2 are large rooms with king size beds & sofas and the other 2 are doubles. A warm Keswick welcome & scrummy breakfast awaits you. Sandburne Vegetarian Guest House Easter availability in Sandburne - call 017687 73546 / 07795 673687. 3 nights in beautifully appointed en suite twin rooms, with breakfast included from £250. Sandburne is found on the outskirts of town yet only 20 mins walk to the centre and the lake. We offer spacious accommodation, free wifi, plentiful parking with electric charging points, cycle storage, gardens, walks from the door and a very warm welcome. Sandburne was the home of Donald Watson, a local schoolteacher, who invented the term 'vegan' and began the world's first Vegan Society in 1944. Whilst breakfast is always veggie or vegan with plenty of choice, I welcome anyone who wishes to enjoy the peace of the house. Stanger Cottage is a lovely traditional cottage which rests conveniently within the small community village of Braithwaite. The cottage is spacious and homely with comfortable and modern fixtures and fittings and offers a haven for rest and relaxation after long outdoor adventures ensuring a great family holiday. All rooms have fantastic views of the fells which are on the door step and is just a stride away from the village pub and shop with the Whinlatter Forest park being simply a few minutes drive away. Call us on 017687 80088 for details of our fantastic offers. Our portfolio of self catering accommodation ranges from traditional lakeland cottages full of character, through to luxury modern apartments. We therefore have a property to suit your requirements and expectations whatever the occasion. All of our properties are inspected annually by Visit Britain and are all currently graded to a 4 star standard to ensure our guests experience the highest level of comfort on their visit to Keswick and the surrounding area. If you have stayed with us before, you can then be confident on your return stay with us that which ever property you select will offer the same first-rate standard of accommodation. Call us on 017687 80088 or visit the website for details. Jasmine is the perfect retreat for couples, there is both a pub and formal dining within a couple minutes walk from the doorstep, the cottage is only minutes away from the shores of Derwentwater and a 20 minute easy stroll into Keswick. The property has a traditional and welcoming feel with original beams and a cast iron wood burning stove for snug evenings in. Outside there is a patio area with outdoor seating, ideal for that sunny afternoon. Now with free unlimited Wi-Fi. Call Keswick Cottages now on 017687 80088 for our best rates. Brand new furniture and fittings, this bright ground floor apartment, which is dog friendly, is a wonderful base for a holiday in Keswick. It has a well equipped kitchen with new units and an excellent range of utensils and integrated equipment; a refrigerator and freezer, washing machine with tumble drier, electric oven and hob, microwave, and dishwasher. The spacious and airy lounge/diner has a rear aspect with views across the communal gardens to the fells. Bedrooms consist of a double with oak wardrobe and a spacious twin bedroom. The fully tiled bathroom has a deep bath with mains shower over, toilet, wash hand basin and towel rail. 4 night mid week break 29th April - Friday 3rd May available. Charming cottage, private parking and south facing patio area. wi-fi. A true home from home. Large two bedroom ground floor apartment, sleeps 4. Close to town and easy walk to Derwentwater. Latrigg View is a very well equipped and furnished ground floor apartment consisting one double with ensuite (toilet and sink) and one large twin bedroom. Newly decorated, it has a large family shower room, new kitchen and appliances and a light and airy lounge diner. Two minutes walk to Keswick town centre and 5 minutes to Crow Park and Derwentwater. Ideal location for a Spring break. Good walking opportunities straight from the door. Allocated parking space. Double and Twin en-suite rooms available. Quality assured en-suite accommodation close to town centre with Free Private Parking, Free WiFi. Drying/Boot Room. Cycle storage. Enjoying a quiet, unspoilt rural location the Swan Hotel, a former 17th century coaching inn has been sympathetically converted into several quality apartments. On the edge of the village of Thornthwaite, within five minutes walking distance of Bassenthwaite Lake and surrounded by delightful scenery it is the ideal location for a relaxing break. Burnside B&B Phone direct for best prices.01768772639. Free high speed WIFI ,huge breakfasts. We do sometimes have one nights available please phone. Burnside B&B Book direct for the best prices. Free high speed WIFI, Huge breakfast choices. Over 600 great Trip Adviser reviews. Elliott Park Cottages & Apartments April Breaks with up to 20% off! This recently refurbished ground floor two bedroom apartment has been beautifully decorated throughout with modern and luxurious fittings to offer the highest standard of accommodation. This apartment is set in a fabulous peaceful location where you will feel like you are on the edge of town, yet in reality are within minutes of the market square. Suitable for arrival by public transport being just a short distance from the bus station & taxi rank. Allocated parking for two cars & complimentary superfast broadband. Bleaberry & Brocklebeck cottages are converted from our 18thC 'bank' barn. Retaining original features that make these lovely characterful places to stay! Looking out to Helvellyn, and easy walking to the tranquil Thirlmere Lake, Castlerigg Stone Circle, and surrounding fells of the Naddle & St Johns valleys. Brackenrigg House makes a perfect spacious and well appointed house for a group or family gathering! Located just 2.5miles from Keswick, & a 10min drive from Grasmere - with views overlooking Helvellyn - voted the best walk in the UK, perfect for exploring all corners of the Lake District National Park. 5 ensuite bedrooms: 3 double and 2 twin, large double aspect lounge with views to Helvellyn & Blencathra, opening onto spacious dining room and hand made oak kitchen with 4 oven range cooker, microwave, fridge/freezer, dishwasher. Separate laundry room, games room with air hockey table. board games and children's toys. Come and explore all that Keswick has to offer before the main holiday season starts....the crocus and spring blooms are out, the lambs are frolicking in the fields and we have spring cleaned our rooms ready for your arrival! Give us a quick Ring on 017687 74170 for all our latest offers, we look forward to taking your call. We are ideally positioned for an easy short stroll to the town centre and Derwentwater, just park your car and relax . Due to late cancellation, we have 2 double en-suite rooms now available! ….and 2018 was awesome! Roll on 2019! Lots to see, lots to do and all set in the beautiful surroundings of Keswick, in the heart of the Lake District. Due to late cancellation 2 double en-suites now available for the 2019 Jazz Festival. Stay 4 nights or more & receive a 10% discount off your stay*. Quote JAZZ1 to qualify. Not available for on-line bookings. Please book direct with ourselves.